Hindringham Hall Gardens at Hindringham Hall Gardens & Tea Room01328 878226work GardenThe gardens lie within and without the moat. Entrance to the gardens is from the paddock to the east of the moat. All are welcome but most of the paths are of pea shingle and unsuitable for navigation by wheelchairs. This is a working garden supplying fruit and vegetables for the house. All the paths are edged with box and at the centre there is an herb parterre. This organic garden is on a southerly slope to maximise production and abuts the moat. Vegetables include artichokes, asparagus, beans, carrots, parsnips, peas, spinach, salsify, beetroot, potatoes, onions, sweetcorn, lettuce, radish and rocket. Herbs include rosemary, thyme, sage, marjoram, mint, chives and angelica. Fruit includes apples, pears, plums, cherries, grapes, blackcurrants, redcurrants, blackberries, jostaberries, teyberries, raspberries and figs. Some fresh produce is available for sale when in season. The Victorian Greenhouse is a working greenhouse where cuttings and seeds are propagated. It also contains several varieties of tomatoes to produce fruits from August to November. Please enter if you wish. Continue alongside the moat to the Iris and Delphinium Walk. The bearded irises ate at their best in May. The Delphiniums are at their best in June and July. This leads to the Copse. This comprises mainly chestnut, evergreen oak and hornbeam. In spring it is a mass of snowdrops; from May a mass of bluebells. In autumn the base of the chestnuts are alive with cyclamen. From the copse turn left alongside the moat into the Daffodil area. As its shape suggests this is actually a roadway between the moat and medieval fish ponds whose outlines can be seen through the gap in the hedge. It was here that the carp and eel were loaded into carts for the Prior's table ion Norwich or Binham. Today it is an unbroken mass of 32 verities of daffodil (best seen in April), followed by a white carpet of cow parsley. Note also the beautiful views of the house. At the end of the daffodil area is the bog area. Tread carefully if you venture onto the wooden walkway into the reeds beside the weeping willow. Note the giant gunnera manicata, the yellow water iris and the water lilies. This leads to the water garden. This lies alongside the northern bank of the moat and is bisected by a stream - one of the upper reaches of the Stiffkey River. It is mainly planted with primula, hellebores, hosta and day lilies. At their best in May, June and July. Take your choice of cool meandering paths. Note also the orange water trickling from a spring rich in iron and the strange lump of medieval brickwork thought to be the remains of a Mill. The water garden leads to the bridge over the moat. 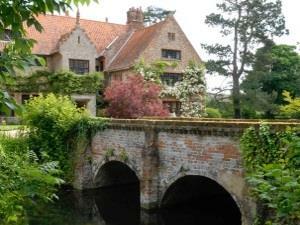 Cross the brick and stone bridge to the inside of the moat and the house. The house is covered with Wisteria followed by a succession of climbing roses. The West Lawn is bounded on 3 sides with formal herbaceous borders giving a mass of colour from April to September. A path alongside the moat is screened by a pergola of scented roses and clematis. The Victorian nutwalk becomes a dark and cool tunnel from July to September. The Wild garden is best in April and May when it is a mass of primroses, daffodils, wild geranium, anenomes and lucojum (like giant snowdrops) beside the moat. Help yourself to the dark red fruits of the Mulberry tree in August. Along the gravel drive is a pergola planted with climbing roses and clematis. Bounding the moat is a carpet of daffodils followed by colchiums (autumn crocus) in August. Coffee and tea is available from 11-4pm in a paved courtyard on the east side of the house. The gardens lie within and without the moat. Entrance to the gardens is from the paddock to the east of the moat. All are welcome but most of the paths are of pea shingle and unsuitable for navigation by wheelchairs. This is a working garden supplying fruit and vegetables for the house. All the paths are edged with box and at the centre there is an herb parterre. This organic garden is on a southerly slope to maximise production and abuts the moat. Vegetables include artichokes, asparagus, beans, carrots, parsnips, peas, spinach, salsify, beetroot, potatoes, onions, sweetcorn, lettuce, radish and rocket. Herbs include rosemary, thyme, sage, marjoram, mint, chives and angelica. Fruit includes apples, pears, plums, cherries, grapes, blackcurrants, redcurrants, blackberries, jostaberries, teyberries, raspberries and figs. Some fresh produce is available for sale when in season. All plants for sale at the entrance gate have been propagated from the plants you have seen in the garden. Open Sundays and Wednesdays 6th April - 5th October.